I will fully accept if no one considers Godwin a sleeper at this point. He might not be. But while he’s going to shoot up in the rankings now that Adam Humphries and DeSean Jackson are gone from Tampa Bay (the rankings cited here haven’t been updated since the start of free agency), his best ball stock might be even higher than you’ll see him in redraft leagues. In PPR scoring, Godwin had 15-plus points five times in 2018, single-digit scoring eight times. You have to figure that overall ratio will improve in 2019, but even then, he’s a player with plenty of boom-or-bust to his game, especially with Mike Evans and O.J. Howard still in town. Sutton didn’t develop like fantasy owners might have hoped after Demaryius Thomas was traded and Emmanuel Sanders got hurt last year, with DaeSean Hamilton and Tim Patrick both out-targeting him down the stretch. Now with Joe Flacco as his quarterback, though, there’s a chance Sutton could realize the potential many saw for him when he was drafted last year. Sutton works well on the deep ball, with a 15.6-yard average depth of target in 2018 that was the deepest on the Broncos by a wide margin, and fifth-deepest in the league among receivers with at least 70 targets. 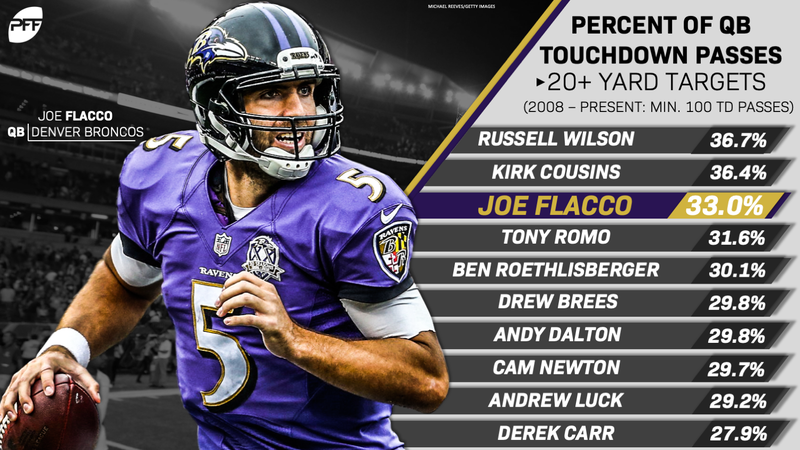 Flacco isn’t the deep-ball thrower he once was, but he does have the third-highest percentage of his touchdown passes coming on passes 20-plus yards downfield since the start of his career, at 33.0% (Russell Wilson at 36.7% and Kirk Cousins at 36.4% are the only ones with a higher percentage). Flacco probably can’t do that sort of thing for a full season anymore, but his aDOT was more than a yard deeper than Case Keenum’s last year, and he could connect with Sutton more than a few times for some big games in 2019. Again, check out those rankings with the caveat that they were made before we knew Donte Moncrief would be on the Steelers, and before some rankers knew where Antonio Brown would land. The bad news is that Washington’s direct line to being a big-time fantasy producer is now capped. But the good news is that that will keep his draft stock low. Meanwhile, it’s not like Moncrief is the second coming of Brown out there. He’s … fine. But it wouldn’t take all that much for Washington to stay well ahead of Moncrief on the depth chart, and if his stock is held in check by the addition of Moncrief, that could provide sneaky value, particularly in best ball, for someone to take him super late. The arrival of Odell Beckham Jr. in Cleveland likely robs Callaway of any serious redraft value, as his best-case scenario is No. 4 in target pecking order behind Beckham, Jarvis Landry, and David Njoku. But he had three receptions of 40-plus yards as a 2018 rookie, and that sort of deep-ball specialty could serve him well, especially if the Browns move Landry to the slot and Callaway can line up on the outside opposite Beckham. As your last or second-to-last best ball receiver, he could have enough long scores and big games to be worth it. 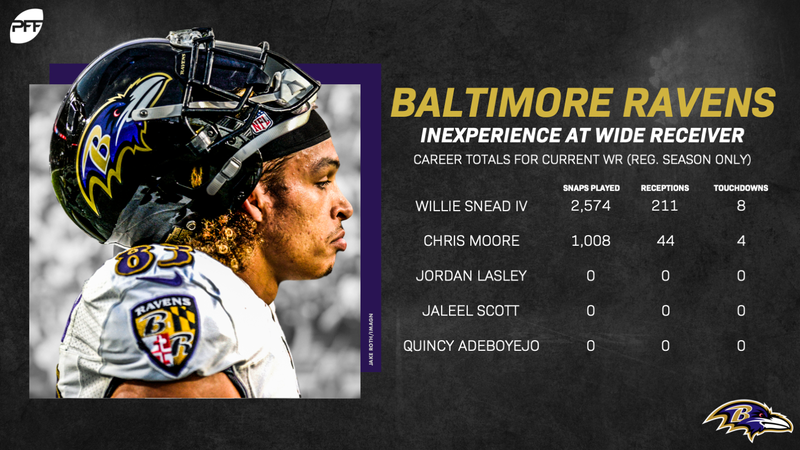 The only real virtue for Snead right now is he’s the only receiver on the Baltimore roster we know to be competent. He has 211 career receptions; the entire rest of the team’s receiving corps has 44, owned entirely by three-year veteran Chris Moore. Jordan Lasley, Jaleel Scott, and Quincy Adeboyejo have yet to see any career receptions. Lasley and Scott didn’t see the field as 2018 rookies, while Adeboyejo has 21 career offensive snaps, all in Week 17 of 2017 and with no targets included. Lamar Jackson doesn’t throw much, but he’ll have to throw some, and they can’t all go to tight ends. Snead is a bottom-of-the-barrel best ball option, but this is a team’s No. 1 receiver you can get around 100th at his position. This is obviously the deepest of sleepers, but the Patriots, despite being linked to both Adam Humphries and Golden Tate this offseason, have only added Bruce Ellington and Maurice Harris and re-upped with Phillip Dorsett so far. That means the team has a paper-thing receiver depth chart behind soon-to-be-33-year-old Julian Edelman. Berrios, a 2018 sixth-rounder, spent his rookie season on injured reserve, but could be a fast riser on a light depth chart if he can show something early. On most teams, we wouldn’t think much of it. But some teams make things happen with the supposed nobodies, like New Orleans with Keith Kirkwood a year ago, and New England is one of those teams. This is a last-round flyer, but with decent payoff potential.